An easy-to-put-together bisquick cake to be served with coffee or tea. This luscious coffee cake is made in a pie dish topped with a crumbly mixture of bisquick, brown sugar, cinnamon and butter. RecipeSavants.com An easy-to-put-together bisquick cake to be served with coffee or tea. This luscious coffee cake is made in a pie dish topped with a crumbly mixture of bisquick, brown sugar, cinnamon and butter. 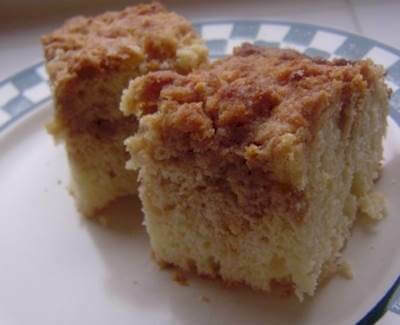 Smart Recipes, American Recipes, Eggs Recipes, Recipes Eggs American Bisquick Coffee Cake PT40M Serves 6 Ingredients: 2 Cups Bisquick 0.66 Cups Water 1 Egg 2 Tablespoons Sugar 0.33 Cup Bisquick 0.33 Cup Brown Sugar 0.25 Teaspoon Ground Cinnamon 2 Tablespoons Butter Preheat oven to 400 degrees F. Grease an 8x8-inch deep pie dish. Mix together 2 cups Bisquick, egg, water and sugar in a bowl well. In another bowl, add 1/3 cup Bisquick, brown sugar cinnamon and butter and with a fork, mix till crumbly. Transfer the dough mixture into prepared pie dish evenly and top with crumb mixture. Bake for about 25 minutes.